Burnley will be without joint record signing Chris Wood for their Europa League third qualifying round first leg tie against Istanbul Besaksahir tomorrow night. The New Zealand frontman has an infection, following a bite, and has stayed at home. And Dyche is also being careful with winger Aaron Lennon, who came off against Aberdeen with a tight hamstring last Thursday. But he has Joe Hart and Ben Gibson available after being registered with UEFA, with Steven Defour and Nahki Wells, who is potentially Derby-bound, dropping out of the squad. 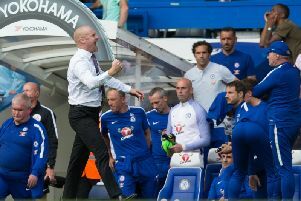 Dyche said of his options: "We’re a little bit limited. Chris Wood has an infection from a bite and has caused a reaction. "We’ll have a few decisions to make. Aaron Lennon came off with a tight hamstring last week. "Steven (Defour) is behind Robbie (Brady) at the moment, and we’re down to 17 players." Hart came in on Tuesday from Manchester City, to give Burnley three of the last five keepers capped by England, and he could make his debut tomorrow: "They’ve travelled (Hart and Gibson) for a reason – to be included if needed. "We wanted to make sure the group are ready for tomorrow. "I don’t do number ones and all that business. "It’s whoever is looking good or right. Tom can’t be available because of the rules. "The depth of Joe's experience means he won’t be easily fazed. He’s another top goalkeeper." As to whether Hart will start, he added: "We don’t know yet. He’s new to the group. We know how easy it is to fit in with No problems there. He’s been around enough over the last few years, at City with changes and players. "He’s in good shape and clear minded. Hes still hungry and got a desire to be the est he can be. ?if he’s playing well he’ll earn the right to play. He’s clear-minded. He knows he’ll have to earn it. He's bought into it." Dyche also landed forward Matej Vydra dfrom Derby County yesterday for an undisclosed fee, but the Czech forward isn't available tomorrow, and will need time to get fit: "He’s different to the strikers we’ve got. He offers a different positional sense. "He can work off the shoulder or in a number 10. He’s slightly more rounded now. He’s well travelled. He’s very strong-minded. There is a strength of character there. He made it clear this summer by not going to a number of different places this summer. It’s a market that’s very tough but it was refreshingly easy. "He’s a bit behind the curve fitness-wise. He’s got to catch up." Asked whether his transfer business is done, Dyche smiled: "This compromises it slightly. It’s an interesting day to have a game!" But he was delighted to tie Ben Mee down to a new contract: "What a good servant he’s been. We’ve got a really strong four there. The other three, I’ve enjoyed what they continue to develop into. It’s another good show of our intent, keeping those with quality and then bring more quality in. It’s increasing the demand on those here to perform."